Sherpa Adventure Gear is selling their sample gear, giving you chance to save up to 75%! Need some new gear for winter? 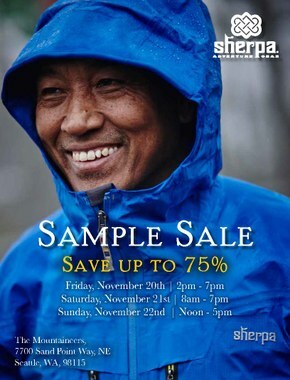 Come to the Seattle Program Center November 20-22, 2015 to buy some Sherpa Adventure Gear! It's their sample sale so you get the chance to save up to 75%, PLUS Mountaineers Members get an additional 25% off! Bring a print out of your Mountaineers Membership page to get the extra discount!